Spacious apartments with three bedrooms and a private pool on the terrace. An excellent option for both permanent residence and short-term rent during the summer season. The complex is located on the shore of the Mediterranean Sea, on some distance from major cities. With its privacy, the complex has everything you need for a comfortable stay all year round: small markert, restaurant, a beach complex with a wide range of entertainment, large swimming pools, 24-hour security in the complex and a well-groomed area. 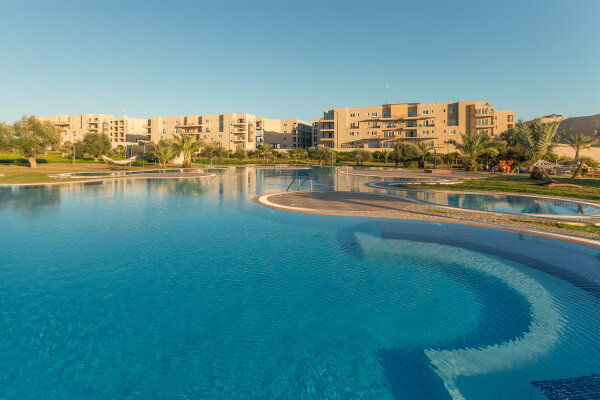 The prices for apartments with a swimming pool vary depending on the type and the closed area: from 96 m2 to 110 m2 and from 109,950 GBP to 149,950 GBP respectively. High quality of construction. Scandinavian design. A unique solution in Northern Cyprus for apartments on the ground floors – an attached private pool. Good infrastructure - playgrounds, restaurant, swimming pools. One of the undoubted advantages of the complex is its location: right on the shore of the Mediterranean sea, seafront, which excludes any construction in front of it, and therefore nothing can close beautiful views from the windows or from the terraces. The complex is designed so that each and every apartment has a sea view.